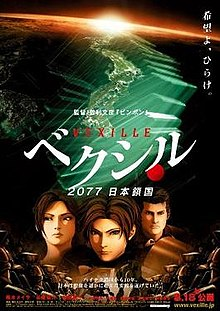 Vexille is a pastiche of every post-apocalyptic, mecha, and special forces anime series made in the last decade, plus Dune, Star Wars, The Road Warrior, The Matrix, The Terminator, I, Robot and The Stand (I'm sure I left out a few). And like an Island of Dr. Moreau mutant creature, it inherits all of their genetic abnormalities to one extent or another. Thus an elite taskforce is tasked to keep conspiring androids from taking over the world from their Death Star-type island fortress (with the required design flaws in its supposedly impenetrable defenses). This island sits in the middle of Tokyo Bay, while the rest of Japan has been reduced to a desert full of giant robotic sandworms and macho guys driving supercharged dune buggies. In the it's-so-bad-it's-good department, I rather enjoyed it because it is so shamelessly derivative and yet takes itself so seriously. It was directed by Fumihiko Sori, who produced the digitally-animated Appleseed. Both have the same look and feel, 3-D anime with motion capture. I don't mind it, as it avoids the "uncanny valley" problem that comes with trying to approach the "human" look too closely, and the motion capture eliminates the jerkiness that comes with low-cost, hand-drawn animation. Appleseed is considerably smarter than Vexille, though it still employs a thoroughly 1960s Star Trek plot involving a pair of rogue mainframes. For intelligent mecha/special forces fare, I'd recommend Ghost in the Shell: SAC, Patlabor and Full Metal Panic: Second Raid. As for pale imitations of The Road Warrior, well, there's always Beyond Thunderdome. The most interesting thing about Vexille is that the bad guys are Japanese and the Americans come riding to the rescue. Granted, our American heroes are as cardboard as any B-grade action flick, and they don't end up saving anything but themselves. But I can't remember another film in this genre where the Americans ride off into the sunset while Japan goes down the tubes. Perhaps the closest thing is the final scene of Planet of the Apes (Charlton Heston version). Vexille doesn't come anywhere near that level of pathos (except stereotypically), and it's sort as if told from the apes' point of view. On the other hand, one sign of being a "developed nation" is making movies about how wicked bad we all are. Vexille is about how the nation of Japan drives itself to extinction because the Japanese are so darned clever. An eye-rollingly ginormous X-Files type of conspiracy is necessary. But that implies one heck of an efficient civil service. Even that's a back-handed compliment. So to conclude on a complimentary note, Vexille provides further proof that, as Gerald Ford wisely observed (widely misattributed to Thomas Jefferson), "a government big enough to supply everything you need is big enough to take away everything you have." Or as Ronald Reagan put it, "The ten most dangerous words in the English language are: 'I'm from the federal government, and I'm here to help.'" Think of it as a libertarian moral fable.